Well, I didn’t end up making the Itty Bitty Carrot Cake Cookies, but I did end up making an off-spring! Meet the carrot cake cookie in breakfast form. I cut down the oil (using applesauce to replace some of it) and amped up the protein, fibre, and healthy fats naturally using ground flax. In my first version, I used protein powder instead of flax, but the texture was weird and the flavour was off. Ground flax all the way! I also left them chunky instead of flattening them down. Much better. The cookies are lightly sweet, with a lovely carrot cake flavour and the texture of a muffin top. I added in a full cup of grated carrots and a tablespoon of freshly grated ginger for a boost of nutrition and an authentic carrot cake flavour. Ginger also aids in digestion as an added bonus. I’m not sure I can add anything to that, so I’ll just give you the recipe! Nutritional info follows. Like a healthy breakfast muffin in carrot cake cookie form. 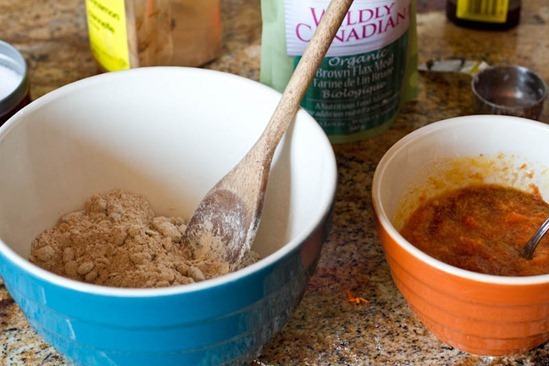 Coconut oil, maple syrup, and fresh ginger work well to create a nice carrot cake flavour, however if you are without those ingredients you can try subbing in another light tasting oil of your choice, other liquid sweetener, and ground ginger (maybe 1/4 tsp?). Adapted from Itty Bitty Carrot Cake Cookies, which was adapted from 101 Cookbooks. Preheat the oven to 325F and toast the pecans for 10-11 minutes. Meanwhile, prepare the batter. 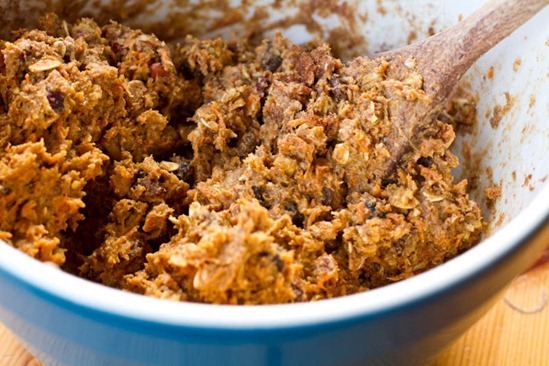 In a large bowl, mix together the flax, flour, oats, baking powder, salt, cinnamon, and raisins. Grate the carrots and ginger using the finest grate. In a smaller bowl, melt the coconut oil in the microwave for about 45-60 seconds. You want the oil hot so it doesn’t clump up when adding the cold wet ingredients. Now add in the maple syrup, carrots, applesauce, grated ginger, and vanilla. Stir well. Remove pecans from the oven and add to the dry ingredients. Increase oven temp to 350F. Now add the wet ingredients to the dry and mix well. The dough will be very sticky, so not to worry. With a spoon, scoop about 13 cookies onto a lined baking sheet. They don’t spread much so you can put them an inch apart. Bake for 14-15 minutes at 350F and allow to cool on baking sheet. Just a word of caution- the dough is very sticky so don’t be alarmed when you mix it up. It’s easiest to just scoop the dough with a spoon and drop it onto the baking sheet. 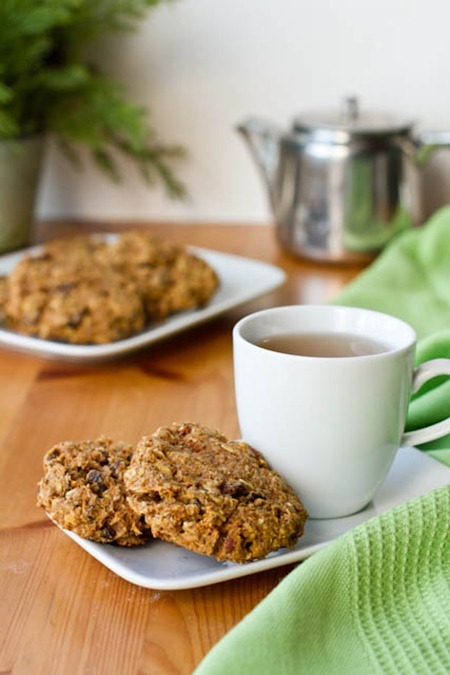 They are a lovely cookie for an on-the-go breakfast or a mid-afternoon snack. And like Eric says, keep in mind that it’s a healthier cookie and you won’t be disappointed. Breakfast this morning was a lovely Green Monster with a side of cookie. 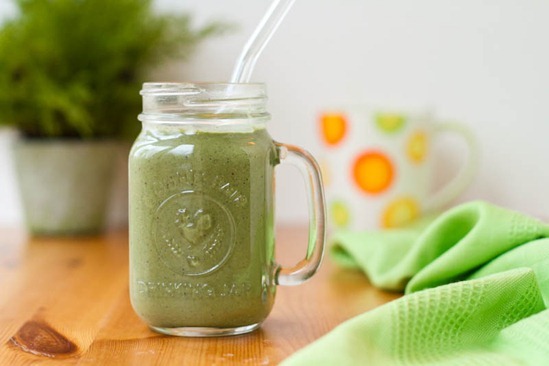 This Green Monster packs in superfoods like blueberries, raspberries, strawberries, chia seeds, and spinach! For more Green Monster recipes, visit the Green Monster Movement. 1. 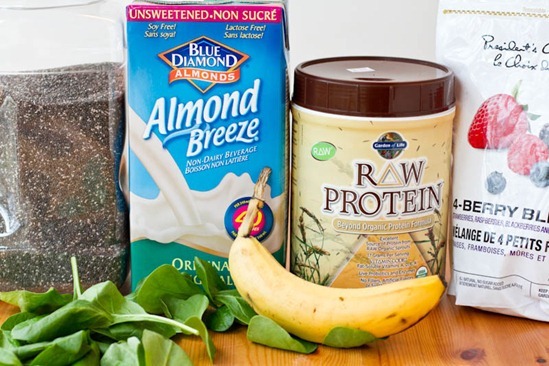 Add all ingredients to blender and blend until smooth. Add ice if desired. Nutritional Info (serves 1): 349 kcals, 14 grams fat, 39 grams carbs, 21 grams fibre, 12 grams sugar, 27 grams protein. 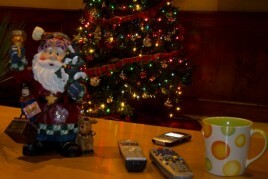 Note the hot tea in the background to warm me up! 3. I also wanted to point out that I added some social media icons on the right hand sidebar of my page for Facebook, Twitter, Pinterest, Email Subscribe, and RSS! Sorry it took me so long…I’m a bit slow with figuring out these things! In case anyone else is interested, I used this WordPress Social Media Widget. Mmm these sound tasty Ange! I bet they made your house smell pretty great as well. Eric is a very good food critic – I know that he, like me, has a highly sophisticated palate when it comes to carrot-based goods lol!!! Have a great day! The house did smell awesome come to think of it! oh how i miss green monsters. i just can’t seem to bring myself to make cold smoothies in the winter time..
I’m so glad I bought a bag of carrots this week! Of course between this and pineapple carrot muffin recipe I found, I’ll need to buy another bag for the chicken noodle soup I was going to make but it’s all good baby! Tell the hubby thanks for his input too. I have a feeling my hubs will feel about the same. But it’s all about variety right! I love how they look unflattened! Such great texture. I haven’t had a green smoothie in way too long! Wow, the PPK top 100 list looks awesome. Need to check that out! And reading the other article, I just realized there is a vegan food truck in Denver! I’ll have to check that out at some point. Bookmarked! My husband is going to LOVE the idea of breakfast cookies! Thank you! These cookies look DELICIOUS, can’t wait to try out the recipe! :) Also – I have been buying a different brand of protein powder lately, but prefer Garden of Life, just wondering do you buy it in store or order it? I’ve heard it can be less expensive to order online, but haven’t found the best site to do so… iherb perhaps? I think Iherb and Amazon carry it although I haven’t purchased it from there yet…been meaning to! Too bad the protein powder didn’t work out – I have yet to find a great way to bake with it. But they still have 4g of protein – I’m impressed! I haven’t had much luck baking with protein powder either…I find the taste always comes through! If I had to use Ginger from my spice cabinet instead of fresh grated Ginger, how much would you recommend? I have everything for these in my possession except the fresh ginger! Thanks! I would start with 1/4 tsp and then taste test and add more if you like. I think, just think your making a LOT of us women stop in our tracks right now with knowing we can HAVE COOKIES for Breakfast!!! OMG!!! I can’t get enough of your carrot cake loaf, so I’m sure I’d also love these cookies! My Green Monster is just like yours, minus the berries :)! I love it! I’m going to make these cookies after falling in love with the itty bitty carrot cake ones…do you think I could replace flax seeds with something else? It’s not easy to find them around here! Thanks! You could maybe replace it with chia seeds (but I doubt you can find those if you cant find flax), however I wouldn’t use a full 3/4 cup of chia…maybe 1/4 cup since they absorb so much moisture. Maybe try 1/2 cup wheat germ or more oats? I love carrot cake cookies! Good call on keeping them unflattened–the texture looks perfect for a snack cookie. Also, I just added that widget to my blog. Thanks for sharing! Hey Jasper, I’m sorry to hear about your Grandpa. You and your family are in my thoughts! Thank you for your kindness…that means so much to me. Well, the cookies went very well :) I made half the batch with protein powder (for me to take to the competition) and half with flour to leave at home with my husband. I liked the protein powder ones, but Phil preferred the flour ;) Anyway, this is a fantastic recipe that I’ll definitely use again. Love the mound of flax going in there!! I didn’t think about it when I read the recipe, but when I was measuring it out it made me really happy :) Thanks! Where do your purchase your chia seeds? I’ve only found them at one grocery store, and they were really expensive. Do you get them online? Awesome! I am so excited about this! My work schedule is really weird now, so I eat breakfast around 7:30 and then need to eat half a meal at 10:30 and the second half at 3. This would be perfect for the first half of my meal at 10:30! I’m definitely making these for next week. hah yup that was the actual pic. I know though isn’t it weird that it didn’t turn colour that much? I was thinking the same thing. I think it was because I only used 1/4 cup and the scoop may have been heavier on the strawberries. I can’t see my previous comment…these look super yummy, can’t wait to make some! What could I replace the flax seeds with? It’s hard to find them over here! Thanks!!! Wow – these look awesome! I’ve been looking for something I can make a batch of and throw in the freezer. I’m in Nursing and my usual hot oats don’t bode well with 7am starts 2x a week! I have been cutting back on my sugar intake and am finding myself really sensitive to sweets! If I cut back the maple syrup to 1/4c, would I have to sub anything else in to compensate or do you think it would be ok? 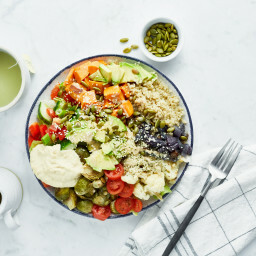 Side note: I have been following your blog since I became vegan three years ago… in fact, this blog is the main thing that helped me when I thought that I couldn’t handle another salad (although now I crave greens!). You have inspired me so much with vegan food! Thank you! Thank you Katie! Congrats on being vegan for 3 years :) If you cut down the maple syrup, I would probably add a couple more tablespoons of aplpesauce, just to make sure they dont end up too dry. anything with the phrase carrot cake is golden in my book :) i would love to have one of these now but I went gluten free for a month. would there be a specific flour you would recommend instead of the whole wheat pastry? GF baking is always unpredictable, but I would like to think the flax would hold the GF flour together? I would probably try oat and almond flour, only b/c I think that would taste great. Let me know if you end up trying a gf version! Carrot Cake BFast Cookies!? Loving it!! 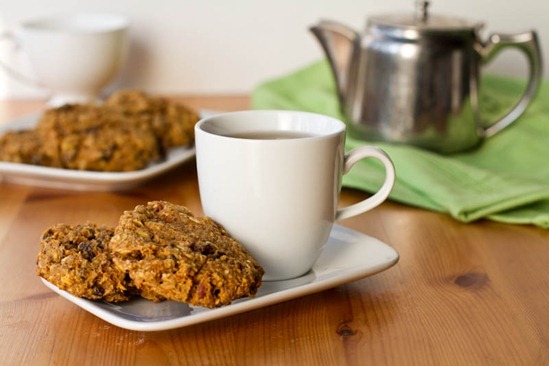 I’ve made some seeded versions of bfast cookies but love the idea of using carrots. I’ll have to make these this afternoon as it’d be a great choice for my kids!! Thank you for providing specifics regarding ingredients that you use in your recipes. So many times I try a recipe and then when I plug in the nutrients they are nowhere NEAR what has been listed. Having the specific products you use makes it easy to see where the discrepancies might be and allows me to adjust if necessary to the products I have on hand. Thanks again! Those made my stomach grumble. I’ve been craving cookies constantly lately… I like to see carrot bits in my cookies, so I would go with a slightly larger grate, but then again, my grating is usually very small even on the big side of the grater! This sounds really good- I think I’m going to try to make larger cookies and have them as a breakfast, along with a little nut butter. I have a huge appetite in the morning and breakfast is usually 400-500 calories! Have you tried Vega protein powder? I’m kind of obsessed with it. And their vanilla chai flavor makes your smoothie green- instant green monster! Carrot cake, and cookies for breakfast! Sign me up! I was looking through your recipe page today to get inspiration for overnight oats, I finally purchased chia seeds! They make a world of a differences in overnight oats! Hey Jamie, I’m really not sure! GF baking can be so unpredictable at times. I would guess because of all the flax it would hopefully hold together with GF flour. I would probably try a mix of oat flour and almond flour? Excellent timing to use up some carrots. But I noticed you have 2 Tb in your green monster for a one serving monster. My husband had me back off for his to only 1 Tb (too much ‘music’ in his intimate office setting). Over the holiday break, I shared with my daughter and she now makes them for herself and her boyfriend after workouts, but he had an ’emergency run’ in the grocery store. And after she served him some muesli with flax seeds on the same day, he’s convinced she’s trying to kill him with biological warfare. So they’re backing off to 2 tsps since she feels like a whale with an upside down blow hole, and he lost half of his body weight (her words, sorry for the mental image). But 2 Tb for you, incredible! The breakfast cookies look wonderful, I’ve gotta try them! And I’m a fan of that protein powder, not harsh to digest and blends well. The only disappointing thing about these cookies is the fact that I just did my big weekly grocery shop and I don’t have all of the ingredients on hand to make them! The look wonderful – I need to remember them for next week. Hope you are having a good Tuesday! Since the winter has been so unseasonably warm I actually have been getting back into making smoothies lately!! Always looking for a new one to try out! I tend to stick to the same boring combos but this one sounds really good! Those cookies look great. I am trying to spruce up my baking skills, I am an excellent cook, but baking is a whole other realm. I am hoping to try some raw dehydrated cookies and see if i am any better at “raw baking”. I will give these a try…cross my fingers! 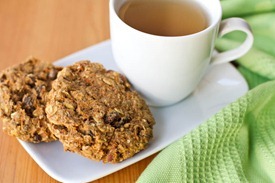 I’m ALWAYS happy to see a recipe for breakfast cookies, love them! Thank you! 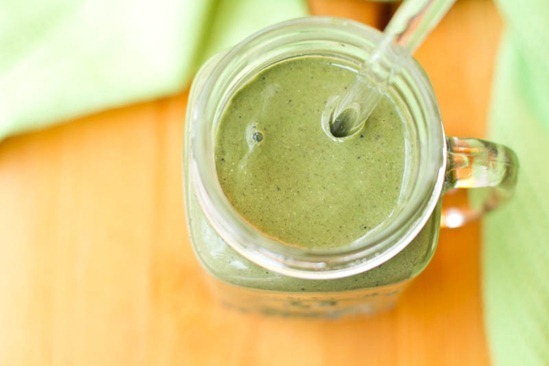 And I’ve been loving my Green Monster lately – I usually omit the berries and put a tbsp of peanut butter or almond butter and it is a creamy nut buttery delicious smoothie! My favourite juice would probably be apple, spinach, kale and some blended berries – so refreshing, so sweet and so good! These cookies look awesome! And it’s also fun to see what you have a breakfast or dinner, etc. on a random day :) Always gives me meal ideas! Good thing I bought a 2 pound bag of carrots this week. I’m off to make these right now! These sound so yummy! Love this idea! Oh I should try apple…I dont use it enough in smoothies! The cookies sound like a fantastic recipe to keep in the freezer and grab for breakfasts. You could add even more omegas by using walnuts instead of pecans! Are Kcals the same as calories? These look lovely and I am such a fan of carrot cake, raisins, cinnamon…all those flavors make me happy. They look perfect for a cool day to put something warm in my tummy. I make oatmeal and blueberry or oatmeal and raisin cakes like this in…the microwave :) Because I am impatient like that. Haha! 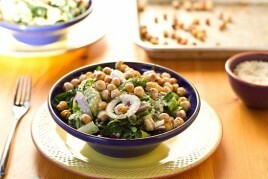 A delicious looking recipe and a great tip on a social media widget. I’m going to use both! carrot cake is so under-appreciated! I feel like I should make a cheering section for it! These look so very delicious! I love using carrots in baked goods!! I’ve really taken a liking to this garden of life one pictured above- you can find it online at amazon or iherb for around $30. I love the idea of a breakfast cookie. Who can’t get behind that? These look amazing. My husband’s favorite dessert is carrot cake…and he is in a breakfast rut! This looks like the perfect solution! This is a great recipe. So glad you shared it with us. Love the muffin top texture idea! 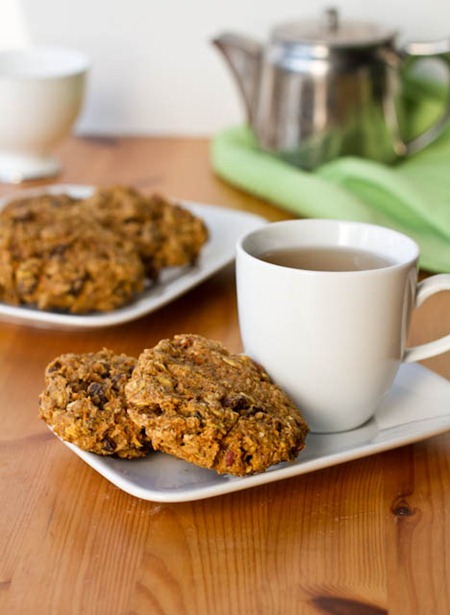 Yum – I am always looking for breakfast cookies to add to my lineup. Maybe it’s the fact that I’m tricking myself by eating a “cookie” for breakfast, but they fill me up nicely! I don’t see the place to subscribe to your website via email, where am I missing it? Oops, I didn’t get that it was an icon! My bad! You had me at “carrot cake”. :D Is there any better flavour? Well, okay, pumpkin pie and chocolate mint rank pretty high, but carrot cake is definitely up there too! I just put these little nuggets of joy in the oven. Can’t wait to try them! The batter was delicious (I may have licked the bowl…) I didn’t have any maple syrup, so I substituted honey- hopefully it will work the same. Thanks, Angela, for yet another amazing idea! BREAKFAST COOKIES OMG OMG!!! I loooove breakfast cookies but haven’t made some in over a year. Can’t wait to try these! Also, what is your opinion: where is the best place to buy a vitamix? Thanks! i just bought mine from their website…but I have heard that Costco brings them on “tours” throughout their stores. I think you’d have to inquire with them when it’s coming to their store (if they are still doing it that is), but I’ve heard they are quite a bit cheaper. Other than that, I’m not too sure. Ok, I just had to post a follow-up: These are fantastic! I just took them out of the oven and promptly ate two, then picked a piece off of a third… debating going in for the rest of the third cookie. YUM! Glad to hear that!! Ours arent lasting very long. Man, can I come over for breakfast? 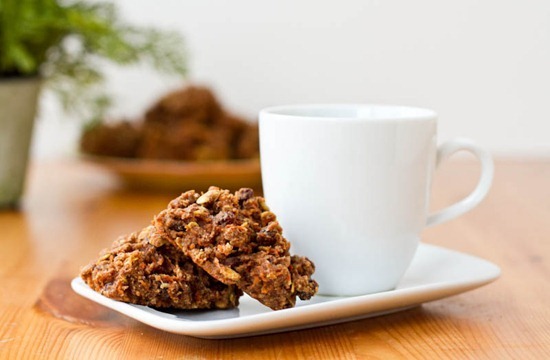 I love cookie/cake like things for breakfast…thank you for sharing the recipe. It looks like chia seeds are popping up everywhere! i love breakfast cookies! not too sweet and healthy! Both recipes look delicious! I have been wanting to try a “Monster” smoothie forever but I haven’t… Can you make them taste yummy without the protein powder? I think it depends on how much you use. I find you can’t taste the spinach at all when using a frozen banana. Enjoy! I loooove healthified recipes of cookies, muffins, etc.! I’ve been craving carrot cake and these sound really good~And I love how honest Eric is with you! He kind of reminds me of my fiance. He’s very careful and gentle with how he describes things, but still honest. :P Aren’t we lucky to have them in our lives?! hehe. Oh, that’s exactly what would I need every morning! Thanks for posting! Where can I get this magic Raw Protein powder? Angela, my hubby has been begging me to make something healthy for breakfast other than the mixed buckwheat and oat hot cereal. I thought this would do nicely so I whipped up a batch tonight. They are perfect! I’ll look foward to having these in the morning. Thanks! The carrot cookie looks so good! I would never of thought of that! 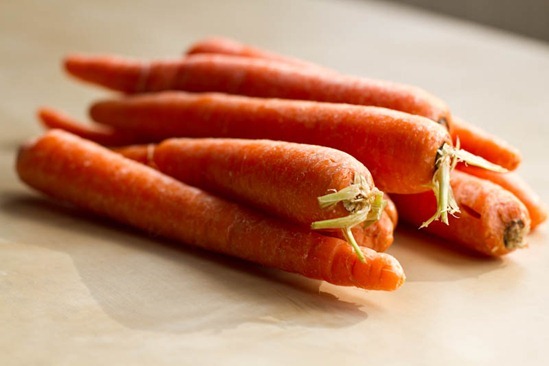 I have a few carrots looking to be created into something tasty. Thanks Angela, I’m going to give this one a try! Luv both of these recipes..they sound great! 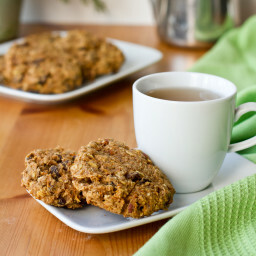 Can’t wait to make a carrot cake breakfast cookie..I have found that I need a bit more than a green smoothie…great idea! This is my kinda cookie! I just pulled them out of the oven and they look delicious! To make gluten-free, I replaced the flour with: 1/2 cup sorghum flour, 1/4 cup arrowroot starch and 1/4 cup sweet rice flour. Then the oats with quinoa flakes. Yummy!! Going to pack 2 in my lunch for today. Thanks for the recipe, Angela. WOW! I can’t wait to make these!!! And I just happen to have a ridiculous amount of carrots right now! Thank you for such a great idea. Those cookies look great! I love a healthy carrot cake recipe! I made these last night and had them for breakfast this morning! They are awesome, very filling and tasty. As a new vegan missing my sweets I don’t even notice these cookies didn’t have sugar, eggs or milk in this recipe. Amazing! I made a GF version of these carrot cake cookies last night and used 1/2C buckwheat and 1/2C sorghum flour and they turned out amazing!! I even brought them to work to a non-vegan, non-GF crowd and everyone loves them. I think I will try them again with almond flour instead of the buckwheat just to see how they might be different. Delicious either way I suspect :) Thanks for the recipe! can i replace the coconut oil with another oil??? I love your carrot cake scuffins so I’m sure I’d love these too. They look delicious! I have been obsessed with your site for a good 3 weeks now! I just recently went vegetarian, and am slowly transitioning to vegan. Your site has soo many AMAZING recipes!! I especially love your VOO recipes! I am a huge breakfast fan, and anything that tastes yummy and can get me through my morning workouts is a thumbs up!! Soo happy i found your site!!! Thank you Angel, what a nice thing to say! Congrats on going veg too! I my goodness these look good! Will have to make them without the pecans as we are a nut free household. Carrot Cake is one of my favourite cakes! Made these tonight! They were awesome! I will add them to my mid-morning snacks at work. The carrot cake cookies sound amazing!! I have a question though, will plain honey work instead of the maple syrup?? Or how about avoiding the ‘whole syrupy’ business altogether?? Will it work? Mmm, we both had vegan carrot cake cookies on the brain. I just made some yesterday but a bit more basic ingredients. Mine were crisper almost like a wholesome cracker consistency. Can’t wait to try your version. Yum! Yummy! I don’t personally like “sweets,” so my dessert creations always tend towards hearty, healthy, and comforting. And this cookie looks like it fits all the criteria (and then some). Thanks for sharing, Angela! Angela – these look fabulous! My husband and I are newly vegan, but we are also omitting any type of oil. Do you have a version that leaves out the oil? Hi Kara, No I’m sorry I don’t, but I assume you could replace the oil with applesauce…but they won’t be exactly the same. I just had one these smoothies! Mine had spinach, banana, blueberries, soy milk, and orange juice in it. So yum!! My ginger was really fibrous, so I think next time I’ll chop it up and smush it with my garlic press. I also think I’ll squeeze some of the moisture out of my carrots next time. I used a medium cookie scoop and ended up with over 30 cookies! Excellent recipe, I’ll be making these a lot! Would this recipe work omitting the pecans? My daughter has a peanut/tree nut allergy and I would really LOVE to try this recipe. Thanks Angela! Yes Im sure it would still turn out just fine :) Just wouldnt have the “crunch” factor. Thank you so much! Gonna try this today, so excited! Hey Tracy, Thanks for letting me know – and Im especially happy to hear they are baby approved! Awesome. Enjoy the rest. I made these yesterday and they are SO good! Even my picky 6, 4, and 18 month old kiddos ate these. Thanks for another healthier yet delicious cookie!! where do you fine whole wheat pastry flour? I haven’t been able to find it at the grocery store. Is there a substitute or can you grind up whole wheat flour more fine in the Vitamix? I just made these and they smell delicious! I left them in balls and toward the end of the cooking time I smashed them down as they were not spreading at all. I could not find ww pastry flour either so did a combo of whole wheat and all purpose…maybe that was the issue? I am srue they will still be tasty even if they don’t look as good as yours do! Hello! I absolutely adore you’re blog. 80% of what I eat are your recipes. Thank you for making being a vegan so easy! Oh gosh we’ve struggled with the same cat food issues too. It doesn’t help that Sketchie has a very sensitive stomach and has had some stool issues in the past. Right now we have him on a natural canned food from Whole foods…can’t quite remember the name but he seems to love it. He’s also on a natural dental dry formula from the vet but I wouldnt necessarily recommend it. We’ve been looking all over for an organic food and haven’t found anything yet. Let me know what you come up with! Orijan is the best I’ve found. Not organic that I know of but they use locally sourced ingredients made in small batches and they don’t test on animals. Thank you, I will certainly check this out! Hi. These cookies look delicious. Do you think it would be possible to make them gluten free? Thanks! I have made these so many times! They are so good and a super easy breakfast for hectic mornings. I have been spreading melted raw coconut butter on them, which made them even better! Thanks for all your yummy recipes. Im sorry I can’t remember..let me know if you try it! I just discovered your website and it is amazing! Do you think I can omit the nuts in this recipe? Would I be able to increase the oats? If so, by how much? I am trying to find nut free/gluten free/ wheat free/ dairy free desserts/sweets for my friend’s daughter. If you have any other recipe recommendations, I’d greatly appreciate them! Hey Vivian, Yes you can certainly omit the nuts if required. I wouldnt increase the oats, but just leave it as is. Enjoy! I wanted to share- I just made these last night but mine were turning out too dry as cookies…so I made them into muffins! I added about 1/2-3/4 cup of almond milk and some applesauce and baked them in a muffin pan for about 20 minutes…They were great! Just thought I’d pass that along! Hey Connor, Thank you for letting me know! I will do my best to find it and remove it. If you see one again, please take a screenshot of it and email it to eric[at]ohsheglows[dot]com – also if you can let us know the brand of the ad, that helps us locate it. Thanks! Hi Angela! I am gluten free and vegan for health reasons that came on in the last year. I saw your suggestions for making them gluten free to Sonia above so I tried it and they are great! I made my own oat flour and almond flour and use 1/2 cup of each in place of the whole wheat flour. I love them and my baby girl who is 14 months loved them too! Thank you so much for all the work you put into your beautiful site and recipes. Your blog and one other vegan blog are my go to’s for dinner every night! Have you tried to make them GF and if so, what type of flour did you use? 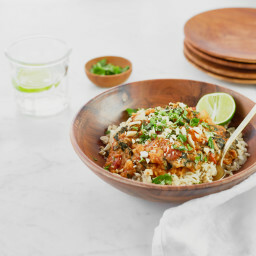 I like to use brown rice, almond or buckwheat usually? Thanks. They are yummy. Made them last year on Christmas morning and will do the same again as the boys loved them and I knew they had some healthy fuel to last for the exciting day ahead! Just tried it with whole Chia seeds and it totally worked! The colour is bad, but the taste and texture so good! Hi I was wondering if the recipe would still be the same if I used a gluten-free all purpose flour? Made the cookies for a pot luck lunch and they were so good!! I kept a few leftovers for me to have for little snacks over the next couple days… well, let’s be honest, they were gone within a few minutes. I made these last night and they were SO good! Incredibly moist and easy to make. I topped the cookies with an avocado cream made with almond milk and a bit of vanilla extract and sugar. My roommates loved them! The cookies followed your Lentil Walnut Apple Loaf, which was also a big hit. I live in a 6 person co-op and we adhere to a vegetarian diet in the house, so I frequently visit your blog for inspiration. Your creative and playful recipes have truly influenced my growth as a cook over the past 6 months, and making food for people is now one of the greatest sources of joy in my life. Thank you! I just made these and they are yummy. Keep in mind they are not super sweet which makes them perfect for breakfast! We have what seems like a ton of carrots from our CSA share. To help use them up I made these last night with my 3 year old. They were a huge hit all around! We all love them! I need to add an update: My 3 year old asked for these carrot cookies for breakfast this morning! The batch I made a few days ago disappeared so I made another per his request. Thanks. Keep on recipe creating. I made these today and they are excellent! I used a regular cookie scoop and ended up with 25 cookies. I think I should have baked them for maybe 10 minutes instead, but they were good. My husband and I liked them and my 4 year old ate one too. My 2 year old sniffed out a carrot and wouldn’t eat his though lol. I’ve got to figure out new ways to get him to eat veggies. Thank you for the wonderful recipe! The best way I’ve found so far, is to finely shred carrots and stir into lemon jello. For broccoli, I slice off the green buds and mix with lime jello. Noticing the date of your comment, perhaps you found other effective ways to incorporate veggies? Hi Angela! I‘m thinking of making these for a 5 day trip. Would make for a very good breakfast! Do you think they would keep ok in a container at room temperature? One question, *how can I have these last the week without molding? * I made delicious blueberry banana muffins off this site last week and they were molded by Thursday–I chopped the molded part off, sliced them in half, toasted them, and topped them with Earth Balance anyway, but would like to know if there’s a recommended way of storing baked goods. Thanks for sharing this recipe. As an Aussie some of the ingredients aren’t as common here so I used what I had in the house at the time: plain flour instead of pastry flour, no pecans, ginger syrup & extra maple syrup instead of applesauce and ground ginger. I found they were rather plain by themselves (to my surprise as I usually like milder flavours) but delicious with marmalade or peanut butter. It’s a great base recipe though and I’ll try them again, perhaps with marmalade IN the mix or with dried fruit or rind, spices (nutmeg, cloves) or lots of fresh ginger. Thankyou! Hmmm… my green monster turned brown… very delicious but not very attractive…I used raspberries – what to use next time? strawberries maybe? 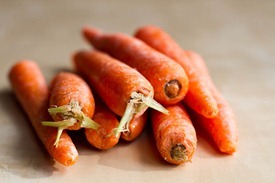 Now off to make carrot cookies – excited!! Hi! 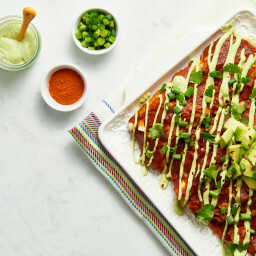 Would regular whole wheat flour work for this recipe? I made this recipe after finding on Pinterest. Your recipes are some of my favourite out there! Even bought the cookbook! Today I want to make these again but don’t have oats. Could I just up the flour instead? Or maybe add more flax? Thanks! This is the second time I’ve made these. They are soooo good. But they do take me 30 minutes to prep-hand grating my carrots and ginger- and 30 minutes to bake to get the bottom crisp and a cooked layer on top. I don’t bother lining the tray with cooking paper and the cookies come off with no problem. Thank you for your brilliance! These look delicious! I never have applesauce around – what do you think about replacing the applesauce with an egg? (I’m not a vegan…) Thank you!! Hi! Just made (& ate) these… AMAZING!!! Unfortunately, I didn’t have everything so I made a couple of swaps… I used light spelt flour, chopped dates instead of raisin, food processed baby carrots and mashed banana instead of applesauce… And it worked perfectly! I really love that most of your recipes can be adapted with whatever we have on hand, it makes every single recipes I did (about 10000040404838) all amazing and unique. I am basically living off of your recipes and I am always amazed by your creations. So soft and chewy! I used peppitas instead of walnuts, prune purée instead of oil, and they turned out amazing! Great base for vegan fat free cookies. I could never master “lightly packed” anything :) so could you please give the weight of the shredded carrots in grams? And if possible (pleease) give all weights in grams to satisfy this perfectionist so that all my trials of your recipes will turn out like yours! haha you’re comment is the best! I actually started adding metric measurements into my recipes a year or two ago, so all of my recent recipes have the weights in them. :) I hope someday all of them will though! Thanks for your input! Sounds delectable, could you sub coconut flour for the whole wheat pastry flour? Thanks! Hey Taylor, Coconut flour tends to be a hard flour to work with as a sub because it soaks up a ton of moisture in recipes and it also doesn’t contain any gluten (which whole wheat flour has). So my guess would be that you’d have to combine coconut flour with other flours for it to have a chance of working. 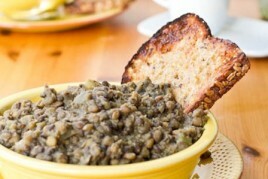 Previous post: Triple Lentil Recovery Soup & Booty Camp Fitness Giveaway!